Here is a fun accessory for your Nintendo Wii, that will definitely appeal to all the Star Wars fans out there, the Darth Vader Wii Sensor Bar Holder. 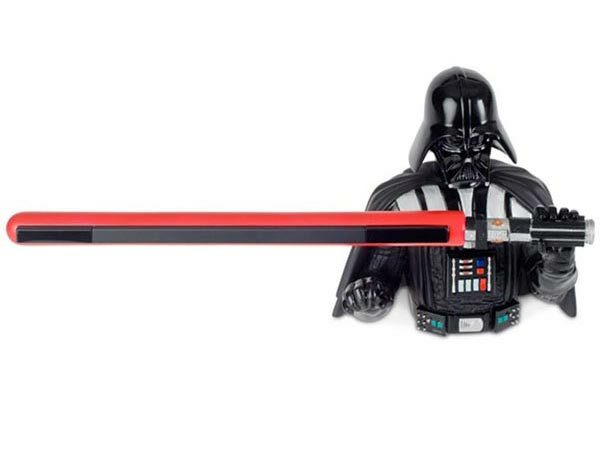 Instead of a plain old Wii sensor bar on top of your TV you can now have your Wii sensor bar displayed in this fun Darth Vader figure, and as you can see from the photo, the sensor bar is held by Darth Vader’s lightsaber. This fun Darth Vader Wii Sensor Bar Holder is made from high density resin and it is designed to hold the Wii sensor bar whilst maintaining the full range. If you want one they are available to pre-order for $49.99 from the Star Wars Shop.